Trace the fortunes of ancient Egypt on this sightseeing tour from Cairo. Visit tombs and pyramids used by the pharaohs with your guide, and follow in the footsteps of Egypt’s powerful rulers at the Step Pyramid of King Djoser, the Great Pyramid of Cheops, and the Sphinx. 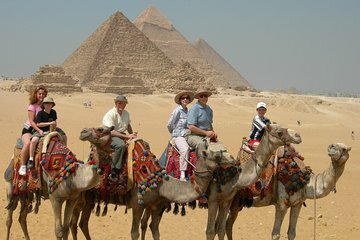 Gaze over the mighty pyramids from the Giza Plateau, and explore the Sahara Desert by camelback.